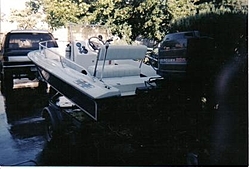 I saw that 16 in Boats4Sale and was wondering if anyone had any experience/opinions on it. have any of you guys ridden in one? I'm lookign for a little bay boat to fish out of that will be easy to trailer and I think this fills the bill. what do you guys think a project 16 is really worth? I just took a peak at that ad. You could turn that into a real gem. I think it would be sweet to bay fish from. You could get up in some really shallow water. Mine had a 150 Merc. Sweet toy..................... Handled the water beautifully. got my little project 2 weeks ago...started gutting it yesterday...looks like its gonna be a fun project I'll post pics of the progress. The flounder better watch out this spring! If you need any parts, give Coen a call at Superboats (631-226-1761). We also still have all the templates for the 16. Good luck. I'll be here for advise if you need it. everything is all there...just need to strip it and repaint the floor...gel is in good shape, i'm going to remove the bottom paint, wet sand and compound the entire hull, deck and console...add new harward like pop up cleats, new nav lights...new dash and then find some power for it. hey...just to be sure, ask john if the floor was always glass over wood and not a liner...this boat has no liner. and oh yeah...i'm gonna need some superboat stickers! Whats the matter your camera broken? Glass over wood. Post some pics of that SUPER16! Are you going with a 300X?? ?hehe Later. The floor is fiberglass over wood. A layer of 1 1/2 oz mat and 22 oz roving. Thats how they all are.